Sep. 24, 2014 11:00 p.m. Team BC goalie Sarah MacDonald is clear-headed and focused as she counts down to the 2015 Canada Winter Games (CWG) ringette competition. This wasnâ€™t necessarily the case last April during the 2014 Canadian national championships in Regina. Thatâ€™s when the 16-year-old, who is in Grade 11 at R.E. Mountain Secondary, suffered her first ever concussion after being accidentally run into by a U16 player from Team New Brunswick. â€œMy helmet flew off, and I got taken down, and my head hit the ice,â€ MacDonald said. She didnâ€™t lose consciousness and finished the game, but soon afterwards packed it in for three weeks while recovering from symptoms that included nausea and dizziness. With the concussion (and the baggage that came with it) behind her, MacDonald is joining fellow Team BC members at a weekend-long training camp that gets underway Friday at the Langley Events Centre with two hours of fitness testing in the gymnasium. Team BC â€“ which will go for gold at the CWG ringette tournament at the Prince George Coliseum from Feb. 13 to March 1, 2015 â€“ will then be on the Langley Sportsplex ice this Saturday for a 1 p.m. exhibition game against the National Ringette League (NRL) B.C. team. MacDonald is part of a family that has ice in their veins, so to speak. Her older brothers Brad, Tylor, and Jason all played ice hockey, with Jason being drafted into the Western Hockey League. MacDonald, herself, played hockey for a short time before switching to ringette. Her love for the sport stuck. Awareness is something ringette could use a little bit more of, particularly in the left coast of Canada. Even though the sport has roughly 1,800 registered players between the ages of four and 57 in this province, ringette is not as big in B.C. as it is in other parts of the country, in MacDonaldâ€™s opinion. â€œPeople will ask, â€˜what sport do you play?â€™ Iâ€™ll say, â€˜ringetteâ€™ and they wonâ€™t know what it is, and youâ€™ve got to explain to them that itâ€™s like hockey, but itâ€™s not,â€ MacDonald said. 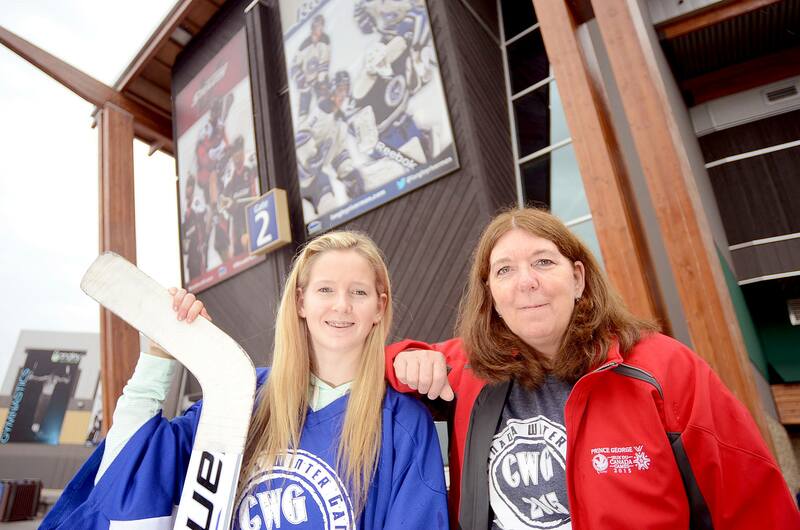 But in some provinces outside of B.C., ringette has a solid foothold. â€œEveryone knows about it,â€ MacDonald said. â€œI canâ€™t even think of skating that well,â€ she laughed. Ergo, her move into the net at six years of age. Power skating sessions with her teammates have improved MacDonaldâ€™s skating immensely. â€œThatâ€™s obviously a lot of help with skating, but skating with your goalie gear on is not the easiest thing,â€ she said. MacDonald, who is playing with and against players ranging in age from 16 to 19, relishes the pressure of being her teamâ€™s last line of defence. â€œBefore games, that feeling of being nervousâ€¦ I like that,â€ she said. Offering guidance from behind the bench is assistant coach Kerri Lucas-West, the other Langley resident with the CWG team. Lucas-West has three daughters, Maureen, Jessica, and Jennifer who played ringette growing up. The three sisters and their mom play together on a local over-30 team. â€œI joined in 1989 in the sport and coached my three daughters,â€ Lucas-West said. She went on to coach at nationals numerous times, and will be coaching in her third Canada Games this February. Staff held one identification camp in Northern B.C., one in the Okanagan, and another in the Lower Mainland. From those auditions, players were invited to the selection camps. Between August 2013 and May 2014, selection camps were held and releases were made. In May 2014, Team BC attended a Pre-Canada Games tournament in Saskatoon with 26 players â€“ this was their final try at making a big impression. After that, staff cemented the final roster of 18 players for CWGâ€™s Team BC. The team is made up of six players from the Lower Mainland, eight from the Okanagan area, and four from the Northern region. â€œWeâ€™re bonding really well as a team,â€ Lucas-West said. Earlier this summer, Team BC gathered for a week-long training camp in Salmon Arm. Lucas-West noted that the camp consisted of off ice training and classroom time. Ringette is not an Olympic sport, so the Canada Winter Games, held every four years for athletes across Canada, â€œis the closest thing to an Olympic experience Ringette players will experience,â€ Lucas-West said. From Dec. 5 to 7, the Fraser Valley Ringette Association is hosting a Spirit Of Winter Tournament in Langley. CWG Team BC will host a division that will include Alberta, Saskachewan and the NRLâ€™s Team BC. Click here to visit the CWG Team BC website.